Extra battery life, but at what cost? There could be a new leader of the battery life pack as the Lenovo P770 smartphone is reported to have an industry-leading juice box. Leaked photos of the P770 appeared on GizChina, showing the handset's battery to be a huge 3500mAh offering. The Motorola Razr Maxx is currently top of the smartphone battery pops boasting a 3300mAh juice pack, but its time at the top looks to be coming to an end. 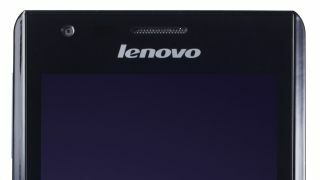 Some specs were also leaked alongside the images of the Lenovo P770, which will apparently offer a 4.5-inch qHD display, dual-core processor, 1GB of RAM, 8MP rear camera and come running Android 4.1. There are no details on how long we can expect the 3500mAh battery to keep the Lenovo P770 going, but multi-day usage between chargers shouldn't be out of the question. We haven't got any details on a Lenovo P770 release date or price, but we wouldn't be surprised if it broke cover in early 2013.